Since 2015, I have covered everything under the sun when it comes to the Zelda community. I remember one of my first big posts was about a woman who took three whole years to make a cosplay of Volvagia from Ocarina of Time that turned out absolutely astounding. From then on, I have experienced the dedication that Zelda fans have toward the series every single day. And one of my favorite kinds of community creations to highlight is musical covers. It is so hard to believe how many different ways there are to recreate iconic music that everyone around here listens to. We are talking arrangements & remixes that have utilized full orchestras, one-person bands that bring new life into the music, works that utilize every kind of instrument or doodad that exists, and even performances in which singers turn their own voices into a multi-instrumental musical groups. Just saying “absolutely astounding” again wouldn’t even begin to cover the love fans have for Zelda. 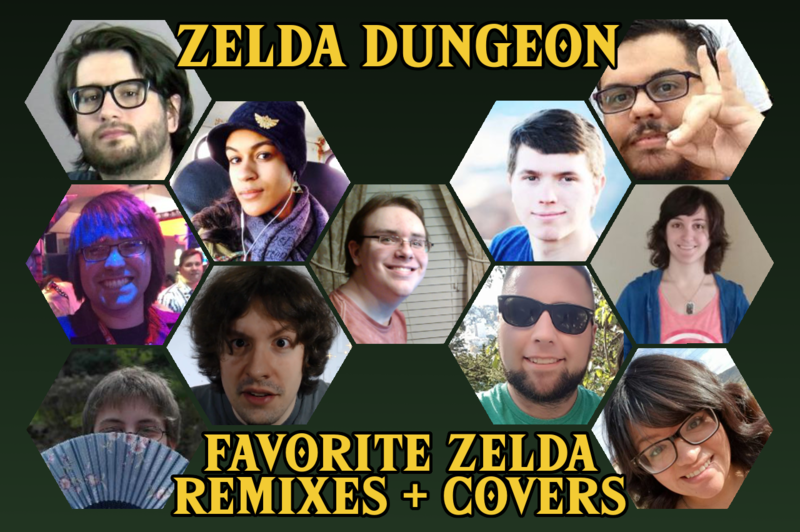 That is why to celebrate Music Week I decided to ask the dedicated writers here at Zelda Dungeon to share their favorite covers, re-arrangements, and remixes of Zelda songs. Our team’s heard everything there is to hear and more when it comes to Zelda music; so why not see what Team ZD-i thinks are the best? While this question did stump a few, a lot of the team knew exactly what covers have done the series justice. I also asked them to provide a little bit of insight as to why they chose their pick. Now without further adieu, here are the editor’s picks for the best Zelda covers of all-time. While the mix is a little outdated, the music quality is still incredible. Each piece flows together beautifully, and someone who didn’t know the individual tracks might not be able to tell them apart. Melody’s mellow remix of “Link is Awake” from Link’s Awakening transcends genre distinctions by mixing together a unique variety of instruments and sounds, including a soft piano lead, a hip hop drum beat, jazzy synth, and spoken word samples. OverClocked ReMix has long been a leading authority on quality video game remixes, and this fact is all-the-more apparent given the top-notch production of this track. This cover of Stone Tower Temple is maybe my favorite Zelda cover of all time. It captures all of the strange, terrifying qualities surrounding the history and lore of the Stone Tower Temple while improving upon the original song. As my favorite dungeon in the entire series, I’m not surprised that a cover of the unique theme song has become one of my favorite tracks to listen to as I’m writing. This cover embodies all of the darkness and wonderment that Majora’s Mask was so good at balancing, and it’s a rare time when I think the cover has surpassed the original. Props to Fenix Ark Angelus for creating such a fantastic cover! I know it’s incredibly long, but, I really appreciate how they use traditional Japanese instruments in some sections and manage to make the music both nostalgic and darker. It makes me view Majora‘s mood in a different light. This instrumental mix is one of my favorite Zelda covers because not only does it sound amazing, but it also captures the epic feeling of Link’s journey to save Hyrule. The mix also reminds me of my first Divine Beast, who happened to be Vah Ruta, and fills me with nostalgia. Theophany has some kind of hallowed gift, able to take already brilliant themes and breath so much life into them; you can see the grooves of bark and feel the damp hanging in the air. A deeply layered masterpiece, Deku chirrups overlay rattling wood percussion and simply epic drums, heightening a brilliant theme into an epic, larger-than-life anthem. The production/beats he creates manage to create a seamless fusion of the original samples from the game as well as the rappers’ verses. It transcends the sub-genre of video game mashups. It isn’t the most beautiful piece of Zelda fan music I’ve heard (anything and everything from Theophany takes the cake there), but it’s just too darned cute! I’m a sucker for lovey-dovey, boy band-style tunes, and it delivers on that 100%. Not only is it a bop, but the lyrics really do capture the kind of first-love vibe I’d imagine Link and Zelda having (more-so Link and Marin actually, especially since Tetra most certainly would not approve of this bubbly cuteness). Nonetheless, it hits some kind of nostalgia trigger, and I love it. This classic OverClocked ReMix is probably one of the quintessential musical Zelda fan creations for me. Already a remix of an incredible top-favorite of mine from the series, this rendition of the Temple of Time theme has absurdly powerful ambience and emotion behind it, and takes on so much new life that I can truly imagine it in an actual Zelda game in an area wildly different than the Temple it comes from. A breathtaking blend of being true to the original and yet spinning it into something entirely different. This song is one of my current favorites as it takes a classic, normally up-tempo Zelda song and dials it up to 20. Whether you’re having a good workout, playing through tough action sequences, or just needing that extra adrenaline rush to get you through the day, this song is a great one to play. Zelda Reorchestrated’s Twilight Symphony serves as not only one of the most ambitious video game fan projects I’ve seen, but also as host to many of my favorite remix tracks. Among the myriad songs that stand out, it’s tough to narrow it down to one, but this album’s rendition of the End Credits theme just hits me like nothing else. Every time I listen to this track, I feel as if I’m experiencing the ending of Twilight Princess for the first time all over again. Like the story of the game itself, this emotional roller coaster of a piece is as bittersweet as it gets. Caught you a bit off-guard, didn’t I? For me, it all came down to which Zelda cover song I listen to the most, and this one popped up at the top of my list. The amount of time, effort, and heart put into this cover from Mr. McGroove makes me love it even more. Tackling seven different parts of one score with only his voice is not something that should be overlooked. I have always been a fan of the Dragon Roost Island theme and acapella, so this was right up my alley. Now to wrap this up in a nice little bow, let’s look at the statistics of our writer’s picks. Only seven games in the Zelda series were represented in our favorites. Four of our picks come from the same title (Ocarina of Time), while three of the covers come from the same artist, Theophany. And on top of all of that, only one of the tunes chosen by our writers comes from a portable Zelda title. What do you think of Zelda Dunegon’s picks? Is there any cover/remix/rearrangement that you want us to check out? Let us know in the comments below!